The Wednesday, April 3, 2019, Climate Justice Forum radio program, produced by regional, climate activist collective Wild Idaho Rising Tide, features news, reflections, and music from eight annual celebrations of Wild Idaho Rising Tide, proposed north Idaho railroad bridges comments and state permit litigation dismissal, citizen and state lawsuits against underpaid royalties and acid fracking of Idaho oil and gas wells, Idaho utility “clean energy” pledge inclusion of mini-nuclear power, eastern Washington train blockage of roads, and other topics. Broadcast for seven years on progressive, volunteer, community station KRFP Radio Free Moscow, every Wednesday between 1:30 and 3 pm Pacific time, on-air at 90.3 FM and online, the show describes continent-wide resistance to fossil fuel projects, the root causes of climate change, thanks to the generous, anonymous listeners who adopted program host Helen Yost as their KRFP DJ. Wild Idaho Rising Tide (WIRT) is celebrating its March 31, eighth anniversary as a regional, climate activist collective confronting the root causes and perpetrators of climate change, through direct actions and locally organized solutions. 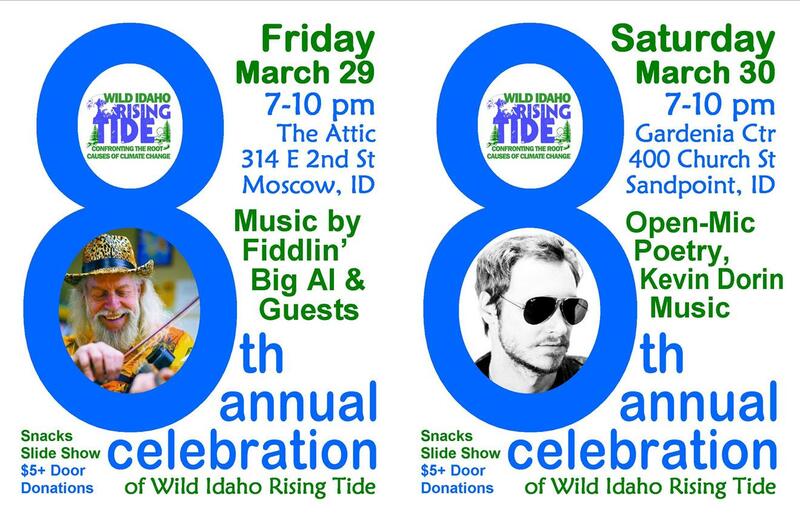 We invite and welcome everyone of all ages to share this milestone at two Eighth Annual Celebrations of Wild Idaho Rising Tide in Moscow and Sandpoint. These benefit concerts offered by north Idaho poets and musicians feature potluck snacks and beverages and a background slide show of WIRT activities at both locations. 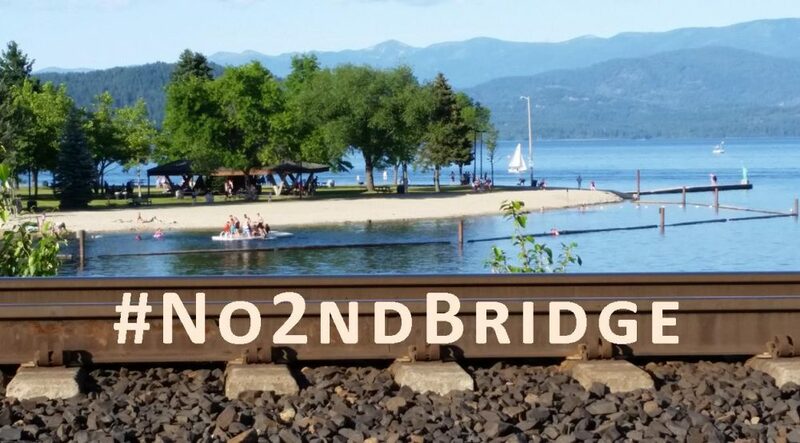 Come and enjoy our yearly festivities that raise awareness, involvement, and funds supporting our #No2ndBridge lawsuit and relentless, volunteer, WIRT activism, in solidarity with frontline communities and grassroots networks of fossil fuel resistance [1, 2]. WIRT activists, members, friends, and allies eagerly anticipate these lively musical and social gatherings. Suggested admission donations of $5 or more at the doors to these otherwise free, public events assist the dedicated work of WIRT and allies to banish new and expanded, fossil fuel infrastructure throughout the Northwest. Please join dirty energy resisters for a well-deserved, reinvigorating evening full of shared camaraderie, spirited conversations, exuberant dancing, good food and drink, and live music of multiple genres, played by talented, visiting, and resident songwriters and performers. KRFP Radio Free Moscow DJ and board member and core WIRT and Standing Rock activist, Fiddlin’ Big Al Chidester of Moscow plays ragtime, honky-tonk piano, fiddle, and guitar, singing old-timey, country blues and original, socio-political satire songs. Al started the practice of playing traditional, phase-shifted, electric viola, adding to his multi-instrumental, experimental Americana repertoire on mandolin, banjo, dobro, and lap steel guitar. He writes humorous, topical songs about peace, freedom, and political hypocrisy, some recorded on his 2004 album Where Were You the Night New Orleans Drowned? and Other Songs for Our Time. Besides performing at Northwest barter fairs and hosting a long-running, jam session at the Moscow Moose Lodge, Fiddlin’ Big Al broadcasts several, weekly, KRFP, music shows, giving airplay to an eclectic mix of genre-bending music, recorded performances from regional venues, and occasional, live, studio sessions . Everyone who would like to read or perform their creative work can sign up starting at 7 pm for a five-minute spot on the stage mic opening at 7:30 pm. The Wednesday, January 23, 2019, seventh anniversary, Climate Justice Forum radio program, produced by regional, climate activist collective Wild Idaho Rising Tide, features news and reflections on north Idaho railroad bridges lawsuit challenges and navigation impacts, Idaho political corruption and governor acceptance of climate change, a New York tractor blockade of gas power plant construction, First Nations resistance to police and pipeline invasions, and an immediate fossil fuel phase-out study. Broadcast for seven years on progressive, volunteer, community station KRFP Radio Free Moscow, every Wednesday between 1:30 and 3 pm Pacific time, on-air at 90.3 FM and online, the show describes continent-wide opposition to fossil fuel projects, the root causes of climate change, thanks to the generous, anonymous listener who adopted program host Helen Yost as her KRFP DJ. The Wednesday, January 16, 2019, Climate Justice Forum radio program, produced by regional, climate activist collective Wild Idaho Rising Tide, features news and reflections on navigation comments on proposed, Lake Pend Oreille, railroad bridges, an Idaho oil and gas commission conflict of interest resignation, pipeline resistors’ disruption of an Oregon governor’s inauguration, coastal, First Nations opposition of police and pipeline invasions, and interviews of indigenous peoples movement activists and Washington DC march organizers. Broadcast for seven years on progressive, volunteer, community station KRFP Radio Free Moscow, every Wednesday between 1:30 and 3 pm Pacific time, on-air at 90.3 FM and online, the show describes continent-wide resistance to fossil fuel projects, the root causes of climate change, thanks to the generous, anonymous listener who adopted program host Helen Yost as her KRFP DJ. The Wednesday, January 9, 2019, Climate Justice Forum radio program, produced by regional, climate activist collective Wild Idaho Rising Tide, features news and reflections on the passing of Uncle Dennis of the Earth First! Update radio show, litigation of a state permit for railroad bridges over Lake Pend Oreille, bridge navigation comments to the Coast Guard, an Oregon appeals board ruling against a Columbia River methanol facility, and Canadian police invasion, arrests, and solidarity actions around indigenous land protection against pipelines. Broadcast for seven years on progressive, volunteer, community station KRFP Radio Free Moscow, every Wednesday between 1:30 and 3 pm Pacific time, on-air at 90.3 FM and online, the show describes continent-wide resistance to fossil fuel projects, the root causes of climate change, thanks to the generous, anonymous listener who adopted program host Helen Yost as her KRFP DJ. The Wednesday, December 26, 2018, Climate Justice Forum radio program, produced by regional, climate activist collective Wild Idaho Rising Tide, features news and reflections on railroad retaliation against grassroots litigation of a lake train bridge state permit, crowdfunding and benefit events for #No2ndBridge legal action, comments on Coast Guard bridge navigation and a Washington methanol refinery, federal court dismissal of coal port claims, British Columbia pipeline blockades by First Nations, failed Alaska oil and gas lease auctions, Interior secretary Ryan Zinke replacement, and other topics. Broadcast for seven years on progressive, volunteer, community station KRFP Radio Free Moscow, every Wednesday between 1:30 and 3 pm Pacific time, on-air at 90.3 FM and online, the show describes continent-wide resistance to fossil fuel projects, the root causes of climate change, thanks to the generous, anonymous listener who adopted program host Helen Yost as her KRFP DJ. The Wednesday, December 19, 2018, Climate Justice Forum radio program, produced by regional, climate activist collective Wild Idaho Rising Tide, features news and reflections on winter solstice, progress and obstruction of north Idaho lake railroad bridges litigation, Coast Guard bridge navigation comments, obstacles to Idaho oil and gas production, Kalispel Tribe reservation air protection, Oregon terminal lease approval of heavier oil trains, hearing opposition to a Washington methanol refinery, a pipeline injunction to cross First Nation lands, and other topics. Broadcast for seven years on progressive, volunteer, community station KRFP Radio Free Moscow, every Wednesday between 1:30 and 3 pm Pacific time, on-air at 90.3 FM and online, the show describes continent-wide resistance to fossil fuel projects, the root causes of climate change, thanks to the generous, anonymous listener who adopted program host Helen Yost as her KRFP DJ. The Wednesday, December 12, 2018, Climate Justice Forum radio program, produced by regional, climate activist collective Wild Idaho Rising Tide, features Paradise Ridge Defense Coalition board members and news discussing an Appeals Court decision on Highway 95 expansion, and articles on north Idaho track inspections and lake rail bridge litigation, airshed redesignation of the Kalispel Tribe reservation, federal court denial of Keystone XL pipeline pre-construction work, a revised port permit for an Oregon oil train terminal, and a proposed Washington methanol refinery. Broadcast for seven years on progressive, volunteer, community station KRFP Radio Free Moscow, every Wednesday between 1:30 and 3 pm Pacific time, on-air at 90.3 FM and online, the show describes continent-wide resistance to fossil fuel projects, the root causes of climate change, thanks to the generous, anonymous listener who adopted program host Helen Yost as her KRFP DJ. The Wednesday, December 5, 2018, Climate Justice Forum radio program, produced by regional, climate activist collective Wild Idaho Rising Tide, features news and reflections on north Idaho railroad bridge litigation, Kalispel reservation air quality re-designation, a proposed Columbia River methanol refinery and tar sands train terminal, Canadian oil-by-rail increases, Idaho fines and possible eviction of oil and gas driller Alta Mesa, and Northwest climate change and Pacific El Niño predictions. Broadcast for seven years on progressive, volunteer, community station KRFP Radio Free Moscow, every Wednesday between 1:30 and 3 pm Pacific time, on-air at 90.3 FM and online, the show describes continent-wide resistance to fossil fuel projects, the root causes of climate change, thanks to the generous, anonymous listener who adopted program host Helen Yost as her KRFP DJ.